By the time the onshore breeze has made Bondi unappealing, the water is still calm at the Dawn Fraser Pool. The beach of the Inner West is Australia's oldest swimming pool, yet for something that has been around for so long, very few people know about it. This tidal flow salt water pool is frequently used for water polo and has been since it was built in 1880. The beautiful location makes it a pleasure to get in the water for a dip without having to deal with the traffic of the eastern suburbs. 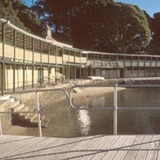 You step into this harbour pool and notice the beautiful wooden decking and all encompassing grandstand. It's quaintness and quiet sophistication is something you don't expect nestled into the dramatic Elkington Park in Balmain. The wooden decking is certainly better than sand and you can claim one of the many booths around the pool to drop your gear in, or lay your towel out to soak up some rays. This is an untapped resource for many Inner-Westians and Sydneysiders alike. It has all the benefits of a beach, without the bad bits – no sharks, no annoying sand turning up in everything you took with you and more, and no English backpackers! The water quality is tested frequently and remains open when the levels are up to standard! The Dawn Fraser Pool closes during the colder months, but will be re-opening in October when Sydney begins to shine. During a big low tide a sand patch emerges to really bring that beach to the Inner West! With lockers, amenities and a small café, you couldn't really ask for much more. Click here for opening times, prices and more. Why? everyone loves a dip!